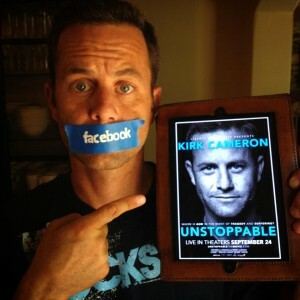 The social networking site Facebook has provided an explanation as to why links to Kirk Cameron’s new documentary website were blocked for a time last week. As previously reported, Cameron, known for his role as the young Mike Seaver of the 80′s sitcom Growing Pains, and most recently as the co-host of the Way of the Master evangelism training videos, first alerted followers that attempts to post a link to the site for his new documentary Unstoppable were being flagged as spam. The site only contains the embedded film trailer at this time. Cameron also explains that the project is his “most personal” film to date, and is a reflection of his journey to “be honest and examine [his] questions and [his] doubts.” He outlines in the film trailer that the “meat grinder” experience made his faith in God stronger than ever. However, just a day after announcing the film online, Cameron posted on Thursday that Facebook had barred him from posting a link to the documentary website. He then asked followers to share his status on their pages in an effort to urge Facebook to unblock the site, and announced the following day that Facebook had apologized and rectified the issue. Now, Facebook is offering its explanation to the public as to why the site was unable to be posted. Cameron’s trailer was also barred for a time by YouTube after being marked as spam, but was later restored. Cameron plans on simulcasting the film live from Liberty University in Lynchburg, Virginia to theaters and other venues across the country. “Theaters full of people who love God, even in the midst of tragedy, is a powerful witness to everyone that life is stronger than death, good is stronger than evil, and faith is stronger than doubt,” he said.